Each cupcake consists of a chocolate cupcake, a frosted mini donut, green frosting over it all, and green sprinkles. The eyes and teeth are marshmallows, the eyeballs are chocolate morsels, the smile is black frosting, and the antennae is a green Laffy Taffy. 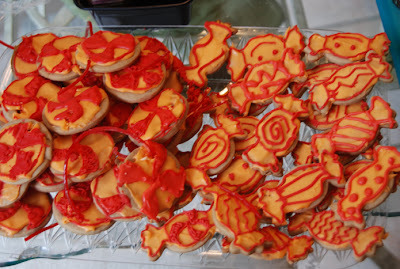 We also made sugar cookies decorated like candies. We used a delicious Bon Appetit recipe for holiday sugar cookies from 2000. We added string candy to the round cookies but they hardened and cracked more often than not. My daughter has recently gotten the baking and dessert decorating bug. We are really lucky to have a speciality store in our area, Wine & Cake Hobbies, that solely focuses on supplies for cake decorating, and candy, wine, and beer making. Very cute and yummy-looking! You're going to make cupcake-gobbling 9-year-olds with the Om Nom. Your daughter did a fabulous job! I'm definitely on board with any food that includes a cupcake AND a donut frosted together. Yum! It was a bit too decadent for me, but the kids loved it! 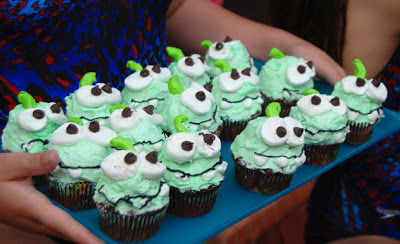 I love the Om Nom cupcakes! Adorable! I wish we had a decorating supplies place in town! Of course, I'm too lazy to actually decorate but I do love looking at that stuff. LOL! How cool that your daughter has been bit by the baking bug! I wish my lazy boys would be.